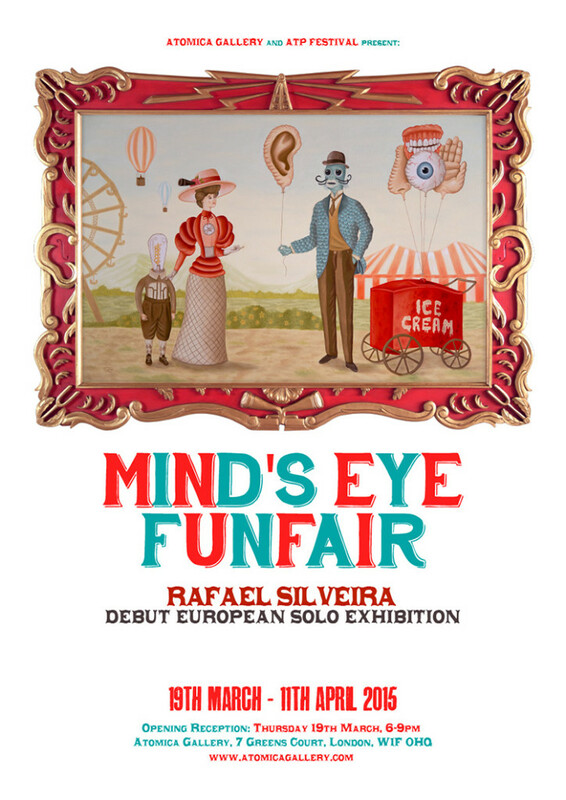 Atomica Gallery and ATP Festival are delighted to announce “Mind’s Eye Funfair”, an exhibition of new paintings by Brazilian artist Rafael Silveira (b.1978). Opening March 2015 at Atomica Gallery in Soho, London, “Mind’s Eye Funfair” will be the artist’s debut European solo exhibition. For this exhibition Silveira has created a parallel universe in which his own stream of consciousness comes to life. In this surreal and magical ‘funfair’, viewers will encounter everything from a carousel of horses filled with discordant symbolism, to anthropomorphic, tattooed beings and much more in between. “Mind’s Eye Funfair” will comprise of a series of oil paintings rendered on a mixture of large-scale panels, metal sculpture and canvases. All of Silveira’s creations are executed in a clean, illustrative style that showcases his impressive technical ability. For one of the works, Silveira has worked with traditional craftsmen to create a custom designed frame, allowing for an interesting interplay between the external structure and what it contains within. 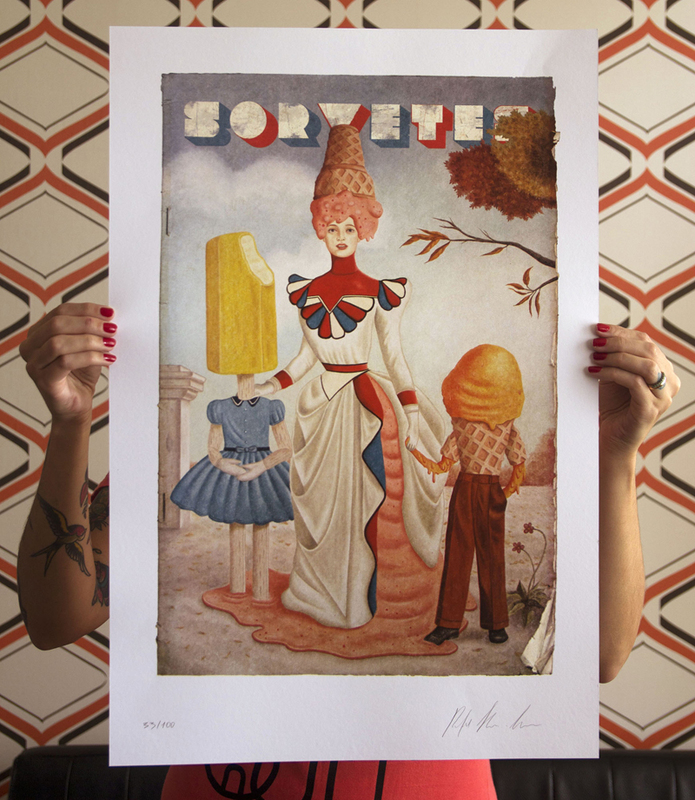 As well as Rafael’s magnificent paintings and sculptures we also have a beautiful signed limited edition four colour silkscreen print of ‘SORVETES’ (see below) – edition of 100. We only have 20 available and there is a special opening night price of £40 (£48 after). Currently based in Curitiba, Brazil, Silveira quit an award-winning career in advertising to dedicate himself to his fine art practice. He has since gone on to exhibit in prominent international galleries including Jonathan Levine in New York City and the Museum of Modern Art in Rio De Janeiro. He cites the master of pop-surrealism Mark Ryden as one of his main influences, as well as lowbrow legend Todd Schorr and cult cartoonist Robert Crumb (Silveira even has tattoos of Crumb’s artwork adorning his skin!). Two monograph books of Silveira’s work have been published in Brazil. “Mind’s Eye Funfair” will be the first showing of Silveira’s work in the UK and was made possible by the support of ATP Festival. Join us for the opening reception on Thursday 19th March 6-9pm for the first peek of this wonderful exhibition! Rafael will be present at the opening. Please RSVP to rsvp@atomicagallery.com or join the Facebook event HERE.